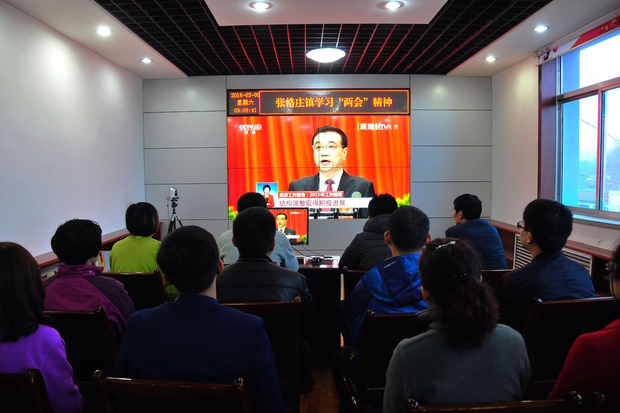 People in east China’s Shandong province watch Chinese Premier Li Keqiang deliver his work report on live television at the opening of the National People’s Congress in the Great Hall of the People in Beijing, March 5, 2016. For the first time ever, a senior Chinese leader announced in his work report to the National People’s Congress—his most important formal speech of the year—that environmental violators and those who fail to report such violations will be “severely punished.” Premier Li Keqiang reported that China had succeeded in meeting or exceeding the previous Five-Year Plan’s environmental goals. The draft 13th Five-Year Plan, released March 5 and scheduled to be passed (likely without amendment) in the coming days, builds on that success, requiring greater reductions in the emissions of many pollutants and adding a major air pollutant, volatile organic compounds (VOCs), to those with specific reduction goals, or “hard” targets. The headline news for many has been the announcement of a total energy consumption cap of 5 billion tons of what Chinese experts term “coal equivalent,” a standardized measurement used to add all energy sources together, thus for the first time stating that overall energy use, not just coal use, will be limited going forward. At the same time, perhaps in recognition that progress is moving more quickly on air quality than in other areas of environmental concern, the work report and the Five-Year Plan heavily emphasize the need to improve water and soil quality. China’s announcement of a total energy consumption cap of 5 tons of coal equvialent comes after the success of the 12th Five-Year Plan from an energy perspective, in which energy and carbon targets were met and surpassed. Between 2011 and the end of 2015, energy intensity (i.e. energy consumption per unit of GDP) fell by 18.2 percent and carbon intensity declined 20 percent (see chart below). These declines are due in large part to the drop in coal consumption: down 3.7 percent in 2015, following a 2.9 percent decrease in 2014. This rapid decline in the growth of energy consumption was seen in the total from all sources of 4.3 billion tons coal equivalent used in 2015, an increase of less than 1 percent from the previous year. That markedly slowed consumption, coupled with the decline in heavy industry, suggests that achieving a 5 billion metric ton energy cap will not be challenging. Looking to the next five years, Chinese targets again seem easily manageable, and also put the nation in a good position to meet its commitments under the Paris Agreement on Climate Change, which China signed in December 2015. Under the 13th Five Year Plan, China plans to reduce energy intensity by 15 percent. Demonstrating that non-fossil energy sources are becoming a more important part of the Chinese economy, the carbon intensity target of 18 percent is now a full three percentage points higher than the energy intensity target. In other words, while five-sixths of the carbon target will be achieved by improving energy efficiency and the shift from heavy industry to less energy-intensive sectors, the remaining one-sixth will rely on the rapid growth in renewable and nuclear energy. This is a significant increase in the importance of non-fossil fuel from previous five-year plan targets, in which there was only a one-percentage-point difference in the two targets. One of the major initiatives to achieve these climate targets will be China’s emissions trading program, which will expand from seven pilots to nationwide coverage by 2017. The 13th Five-Year Plan tasks the government with developing rules and regulations to manage the program’s oversight. The plan is ambitious; it will encompass six industrial sectors. Another initiative focuses on reducing China’s energy intensity through a commitment to high-speed rail. Rail systems for intercity travel are more energy efficient than either automobiles or air travel. The government has committed 800 billion yuan to rail projects in the next five years—that’s more than U.S.$120 billion at today’s exchange rate. China also has plans to increase urban rail and rural bus service. The plan continues China’s ambitious efforts to plan the urban shift of its population, and both the plan and the Premier’s work report emphasize that urban planning should promote green development and energy efficiency. Chinese air quality actually has improved since 2011, not just as reported in official data, but independently, by examining satellite data, as well. However, the consensus from both government and experts is that these are early steps and much more remains to be accomplished. Barely one-fifth of Chinese cities meet the air quality standards defined by the Chinese government. The new 13th Five-Year Plan sets ambitious targets for air quality progress, requiring hundreds of cities to 80 percent of the time meet “good” or “excellent” standards—meaning they must score below 100 on China’s Air Quality Index of 0-500. The 80 percent target is in addition to a target to reduce the number of polluted days by 25 percent, and to reduce by 18 percent the number of days when PM2.5 (the air pollutant of particular health concern) exceeds allowable limits. The plan also steps up the reduction targets for the two major air pollutants that had been in previous plans, sulfur dioxide and nitrogen oxides (SO2 and NOx). The previous targets were met and surpassed handily, and as noted above and elsewhere, this progress has been documented by NASA and others. In sum, no locality—not even those that have made progress—can stand still. They all will have to reduce pollution further. This still won’t leave China’s cities genuinely clean; after all, 80 percent is a far cry from 100 percent, but it is a major step forward. One major reason to expect progress in the 13th Five-Year Plan is the addition of a target to reduce Volatile Organic Compounds (VOCs), which are emitted not just from fossil fuels (especially gasoline), but from paints, solvents, and all sorts of industrial processes. This is the first time this target has appeared in a five-year plan, and VOCs are a critical component of both PM2.5 and ozone. The plan aims to reduce VOCs nationwide by 10 percent or more, with an emphasis on major cities and industries. While most coverage of China’s air pollution problems emphasizes PM2.5, the reality is that most PM2.5 is what is known as a secondary pollutant, produced in the air from other pollutants that China regulates, including sulfur dioxide and nitrogen dioxide. The addition of VOCs is ambitious because it requires regulating many more sources of pollution than does managing sulfur dioxide and nitrogen oxides. The largest sources of air pollution are coal combustion, both inside and outside the power sector, and automobiles. The Premier’s work report takes aim at both. It calls for any new coal-fired power plants to be “ultra low emissions,” a standard we have already observed being implemented in China, and one that attempts to make Chinese coal-fired power plants as clean as natural gas plants. Moreover, the work report calls for the replacement of coal in non-power sectors either with electricity (where pollution is easier to treat) or natural gas. The Premier also explicitly calls for China’s oil industry to produce gasoline and diesel suitable for vehicles at the China V standard. China V is equivalent to Euro V, a standard adopted in the European Union in 2009. The lack of clean fuel for clean vehicles has been a long-standing issue in China, and one of the issues targeted in the documentary “Under the Dome,” which was endorsed by the current Environment Minister before being removed from the Chinese Internet. Despite worldwide attention to carbon emissions and air quality in China, the reality is that China’s greatest challenges are with soil and water. While there is much more to do on the energy and air pollution fronts, the positive direction seems clear and the evidence from the last decade is that when the government sets targets they are met. Moreover, energy and air pollution are easier to monitor, while water and soil issues are far more complex and continue to be dogged by multiple questions about consumption, conservation, and pollution from what are known as non-point sources such as farms and households. Water is a major priority, placed immediately following energy targets in Premier Li’s work report, acknowledging the “relatively poor” quality of China’s water and the “severe” over-extraction of groundwater in some regions. China did not meet the goal laid out in the last Five-Year Plan to cap water consumption to 600 billion cubic meters, and instead had consumed 618 billion cubic meters by the end of 2015. Acknowledging the challenge of limiting consumption, the new cap is higher at 670 billion cubic meters and requires reducing water consumption per unit of the nation’s GDP by 23 percent over five years. The plan emphasizes both conservation and reuse. China’s water pollution problem is severe and the major targets here—chemical oxygen demand (COD) and ammonia nitrogen concentration—are but two measures of pollution. Under the plan, in the next five years both must be reduced by 10 percent. That’s more than the 8 percent targeted in the last five years, but lower than what the Chinese government reports already was achieved for each pollutant. In other words, the rate of reduction of these pollutants is seen as slowing. The plan also targets overall waterway health, setting the goal that 80 percent of major waterways meet a tier-three standard, up from the reported current requirement that just 76.7 percent of waterways be kept that clean. The waterway health tiers have not proven meaningful in the past, but there now are two more meaningful policy programs that could influence pollution. The new COD standard addresses mainly industrial water pollution, and the increasing use of continuous emissions monitoring equipment (CEMs), for both air and water, have made this type of pollution easier to monitor and manage. In the past, COD levels fluctuated and it is too early to tell whether the current reported improvements presage a long-term trend. Monitoring should help. For ammonia nitrogen, there are some significant policy changes that should help control this pollutant, whose presence in water is signaled by algae overgrowth that indicates a depletion of oxygen known as eutrophication. Eutrophication is caused mainly by untreated sewage and agricultural run-off. The 13th Five-Year Plan sets sewage treatment targets of 95 percent in cities and 85 percent in counties. It also places a cap on agricultural fertilizer and pesticides, limiting their use to current levels. Another major addition to the 13th Five-Year Plan is the announcement of the release and implementation of a soil pollution action plan. Soil pollution is a politically sensitive topic as it is linked both to farmers’ livelihoods and to the public’s food-safety fears. Addressing soil pollution is complex, and the plan proposes various pilots to attempt to reduce soil contaminants. There has been no publicly available data on the extent of soil pollution in China, only a vague estimate that one-fifth of the nation’s arable land is “contaminated.” This assessment, released in 2014, was based on China’s first nationwide pollution census, launched in 2007, which took more than two years, 570,000 people, and 6 million sources to complete and led to the focus on eutrophication and other key policy innovations. The 13th Five-Year Plan specifies a second nationwide pollution census—a crucial step to better understanding the scope and scale of China’s pollution problem. Land use is the other problem with protecting soil. Construction is a major source of topsoil loss in China and a major contributing factor to urban sprawl and overuse of energy. The plan sets a target to reduce the amount of construction land per unit of GDP by 20 percent, emphasizing a need for denser development. Reforestation long has been one of China’s great achievements. The People’s Republic of China was founded in 1949 with a mere 8.6 percent forest cover. Today, more than 21 percent of China’s land is covered in trees. The target in the 13th Five-Year Plan is to reach 23.04 percent forest coverage. To reach the goal, there is a prohibition on commercial logging in “natural forests.” This goal also contributes to the commitments China made under the Paris Climate Agreement. While reforestation has been a relative success in China, at times it has come at the expense of grassland, with local governments eager to meet forest goals simply planting in what are naturally occurring rangelands. In the last 15 years, there has been a much greater effort to ensure that degraded land is restored to its proper habitat. In the current plan, there is a target of increasing grassland vegetation to 56 percent, which appears to be a target focused on grassland quality. In the past year, China has faced some of the worst industrial disasters in its history, including the major explosion at a chemical warehouse in the Tianjin port that killed more than 100 people. The 13th Five-Year Plan includes a number of safety-related projects, including a national survey to look for dangerous pollutants and specific provisions to upgrade China’s nuclear safety apparatus. Moreover, Premier Li made clear that the government is looking at putting real teeth into environmental enforcement. Not only did he say that those who violated environmental provisions would be “severely punished,” but those who “knowingly allow violations” will be “held to account.” This is the first time that environmental accountability has been mentioned in a Premier’s work report. Ten years ago, the Chinese government added hard targets for the reduction of some pollutants to the Five-Year Plans. Since then, these pollutants have started to decline. This year, we see a new level of environmental accountability added to the next Five-Year Plan, as well as more ambitious pollution reduction targets and a larger number of issue areas addressed. China’s road to cleaning up its environment is not easy. On a bad day, air pollution in many populous cities in China exceeds world norms by as much as 10 times. Water and soil pollution are both more difficult to monitor and to address. Challenges are obvious, but this plan does suggest that the Chinese government has become increasingly focused on addressing them. Kaiyang Xu, a Masters of Environmental Management (MEM) candidate at the Yale School of Forestry and Environmental Studies, contributed research.